Designed for the Industrial Environments | Quad Infotech Inc. 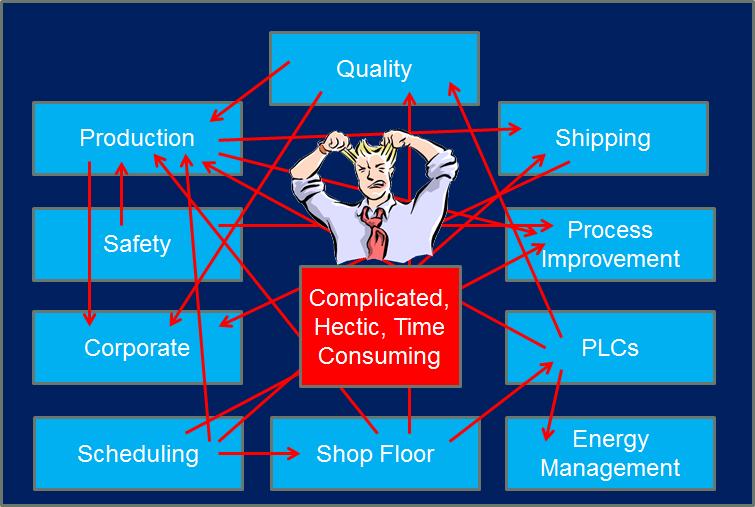 The Industrial information jungle is a metaphor for describing the complex and often messy network of information systems and their interdependence on data. This is the reality of the industrial environment and is often the responsibility of the IT departments to maintain and organize this jungle. A colourful network of systems with different design and architecture fulfilling various tasks, the industrial jungle can be extremely tricky to navigate. Some of these systems are mission critical whose performance is crucial to the operations. Many of these systems rely on the information they receive via interfaces which further add to the complexity of control and maintenance of the entire network. It is the responsibility of the IT teams to manage and maintain this messy network. In addition, the IT team is also responsible for extracting essential data from system systems to fulfill the needs of various user groups. APEX provides all the tools needed to streamline the activities needed to navigate the jungle. The essential tasks of monitoring the operational health of various systems as well as extraction and delivery of information are a part of what APEX does effectively and efficiently. But APEX does a whole lot more. Let us know to give you a demo and show you the power and versatility of APEX.